short girl, long island. : Teach Me Something Thursday, Volume Eight. Howdy! This installment of TMST is brought to you by my partner in craft, Sarina. 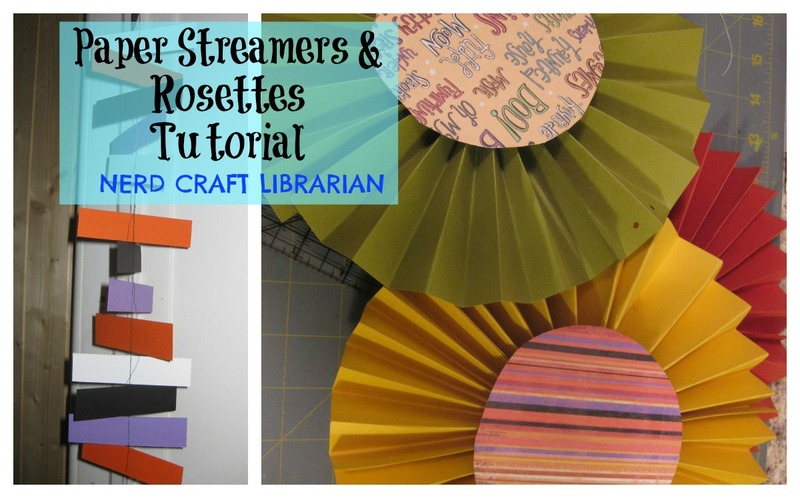 She is going to teach you how to make paper streamers + rosettes for Halloween, but these can be used for any holiday/event you are hosting. I made this with her, so I can vouch that this is something that is simple, but super fun to make. Sarina here from Nerd Craft Librarian. Are you planning any Halloween get togethers? Here are some quick and easy paper decorations! Enjoy! • Hang it up wherever you want! 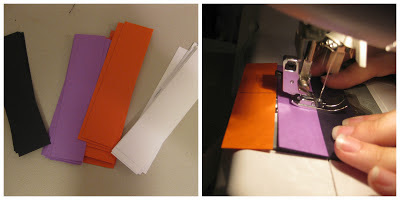 • Use your ruler as a straight edge and take use the exacto knife to score the paper horizontally. This step just makes a groove and makes the paper easier to fold so make sure you don't press to hard! • Once dry, cut a hole and string it anywhere you desire! You can find more of Sarina's fantastic crafts over at Nerd Craft Librarian. This is awesome I never would've thought you could use a sewing machine on paper! Oh I wish I had any talent with crafts - those are great!